Discover The Secret To Achieving Anything You Want! Where Do We Send Your FREE Book? Order Now and We'll Send It Out Today! Success Leaves Traces retails for $21.95, we just ask that you pay shipping and handling (just $7.95 US, $19.95 intl). The Most Powerful System Ever Created To Achieve Anything You Want In Life! Think about this... you can find instructions and classes to learn almost anything... EXCEPT LIFE! It's true. There's not a single class we are are taught or required to take to learn how to achieve our life long goals. Once inside this book you'll learn the 5 secrets to achieving anything you want in life. Whether it be your finances, you relationships, your health or any other aspect of your life, this book finally reveals the true secret to achieving anything. "Success Leaves Traces by Armand Morin is one of the best books I’ve read..."
Success Leaves Traces by Armand Morin is one of the best books I’ve read on accomplishing anything you want to accomplish in life. If your building an online business, and you had to pick one person to learn from, Armand is that guy, and the words of wisdom in success leaves traces are an absolute must read. He breaks everything down into simple steps that anyone can do to obtain any goal they desire. Are you familiar with the elements of Observation, Sequencing, Amplification, and the rest of elements the need to be followed to obtain any goal, dream or desire? Do you even know what the other elements are and how to break them down and use them? There all in this book, and he shows you how to accomplish them step by step. Success Leaves Traces is an easy read but the knowledge you get from it is priceless. If you’re looking to build an online business or achieve any goal or dream for that matter, stop and read this book! It will definitely help you get there a lot quicker. 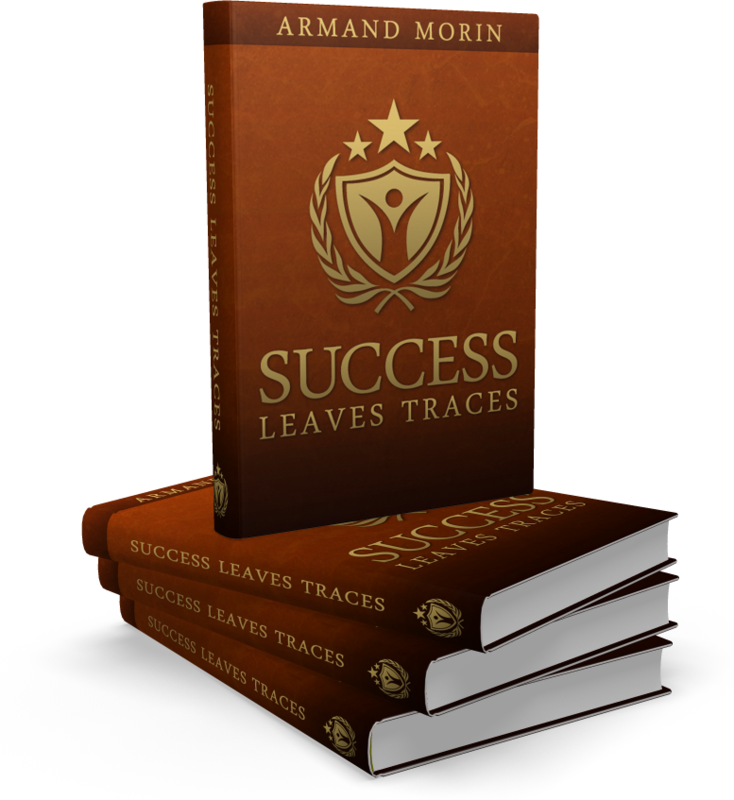 Click Here To Get "Success Leaves Traces"
"It is truly life changing. Thank You Armand!" "Once I took - Success Leaves Traces - book out of the pack I could not stop reading it. It is simply riveting. Just finished reading it last night. This is exactly what I have been waiting for. I have already started implementing several of the 'golden nuggets' of information that I have learnt from it into both my life and business. It is truly life changing. Thank You Armand! " I have followed you for many years now and I sincerely think that this is the MOST IMPORTANT COURSE you have done and it's probably ALSO the most important course done by any webmarketer. It's a pure diamond! Thank you sooo much ! "...plan your way to success, the way the masters do." Success Leaves Traces is a step by step, easy to follow and highly effective guide to help entrepreneurs reach a higher level of focus, productivity and quality of life. Expertly written by one of the world’s leading internet marketers, it breaks down how highly successful people think about and structure the planning and creation process in their business, so that they can maximize their investment of time and resources. Once you learn how to break down literally any project into the right steps and processes, you can plan your way to success, the way the masters do. You learn to follow in their footsteps, as success does leave traces. Get Your Copy Today Before They're Gone! "This is a vital course for everyone to take." The entire Eastern World could benefit from this training. Imagine the lives and careers and marriages saved? The contributions to society made and fortunes made. AND... when people are living their lives on purpose, with purpose there is peace and everyone benefits exponentially. Armand Morin, you not only hit it out of the ballpark on this one---You made it to the stars! "...start creating the future I want." A couple of very heavy weights have been lifted off my shoulders. I can now forgive myself for my past transgressions and can now start creating the future I want.